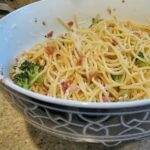 I had some broccoli in the fridge, and I always have pasta, so when I found the recipe for Linguine with Pancetta and Broccoli in my book, 250 True Italian Pasta Dishes , I had to make it. Hubby doesn’t like linguini, he likes spaghetti, so I substituted, but overall I stuck to the recipe. If you like pasta, especially those that are less Americanized, like those drenched in Ragu, then you really should get this book. Check your local library to see if they have a copy. I’ve made quite a few dishes from here and we’ve never been disappointed. I think what I like best about this book is how easy all the recipes are. 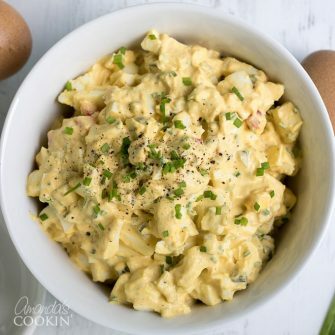 Most can be made in 30 minutes or less, and they all follow the same basic pattern, making it extremely easy to adapt and even create your own recipes. All recipes call for starting the pasta first, then sauteing ingredients in some olive oil, adding a liquid and reducing it. The sauce is then turned off until the pasta has finished cooking. A couple tablespoons of pasta water are added to the sauce, heat it back up momentarily, drain and add the pasta, toss with some cheese and dinner is served! I do urge you to check the library, your favorite bookstore, or your favorite online book merchant (I prefer Amazon myself) and check out this fabulous book. It’s a must have for any pasta lover! I’ve also linked to a few more recipes I’ve made from this book down at the bottom of this post. Amanda’s Notes: The recipe calls for salt, I use kosher salt, which is just for adding to the pasta water. 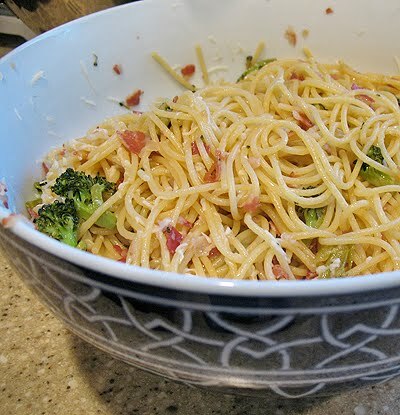 It also calls for linguine, I used spaghetti, and the recipe suggests 3/4 cup grated Parmigiano-Reggiano, where I use 1/2 cup. My husband was raised on that Kraft Parmasan (stinky feet cheese) and that’s what he likes. So when I make these dishes, I always cut the cheese down a bit. In a covered pasta pot over high heat, bring water to a rapid boil. Meanwhile, in a large saute pan, heat oil over medium heat. Add pancetta and onion. Cook, stirring, until onion is soft and translucent, about 3 minutes. Add broccoli and cook, stirring, until tender, 3-5 minutes. Add wine, increase heat to high, and cook until reduced by half. Remove pan from heat and set aside. While sauce is simmering, add kosher salt and spaghetti to the boiling water and cook, uncovered, over high heat until pasta is al dente. Scoop out about 1 cup of the pasta water and set aside; drain pasta. Return saute pan to medium heat; add 2 tablespoons of the reserved pasta water and increase heat to high. 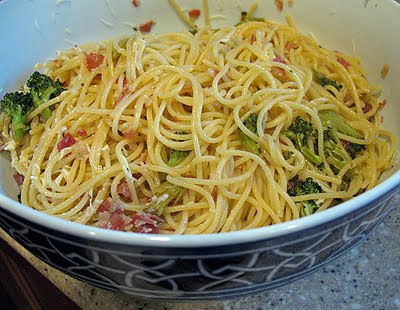 Add spaghetti and toss to coat evenly, adding more pasta water if necessary. Add half the Parmigiano-Reggiano and toss well. Season to taste with salt and pepper. Transfer to a large serving bowl or platter and sprinkle with remaining cheese; serve immediately. Incidentally, the pan I use for this recipe is my FAVORITE pan in the kitchen. It’s my ManPans wok. 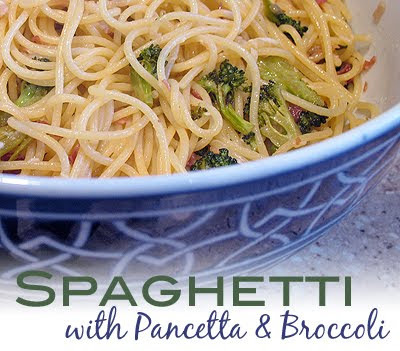 I use it for all my pasta and stir fry dishes and when I fry things too. LOVE it. You can read my review about it here. beautiful pasta.. though i will have to omit the pancetta. This sounds nice and light!